Between this and the X-Men, I get the feeling that comics really don't get how evolution works. 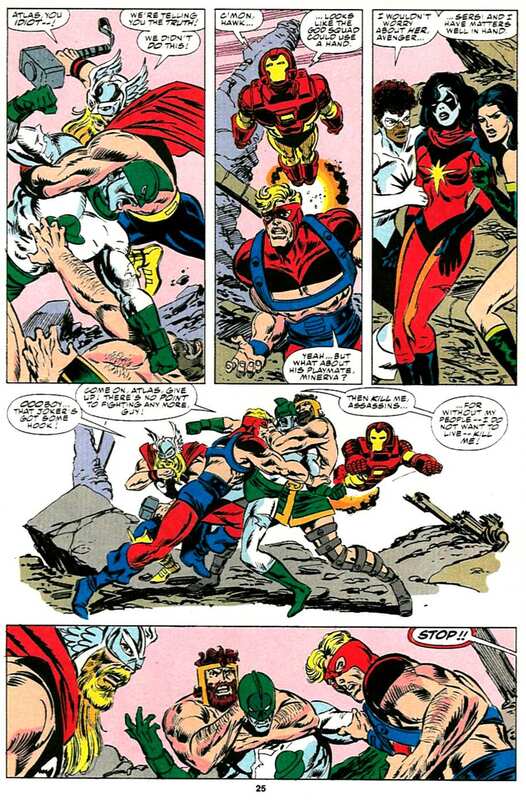 I love how Quasar just casually offers to stop HALF THE AVENGERS. Including, arguably, its most powerful members aside from himself. 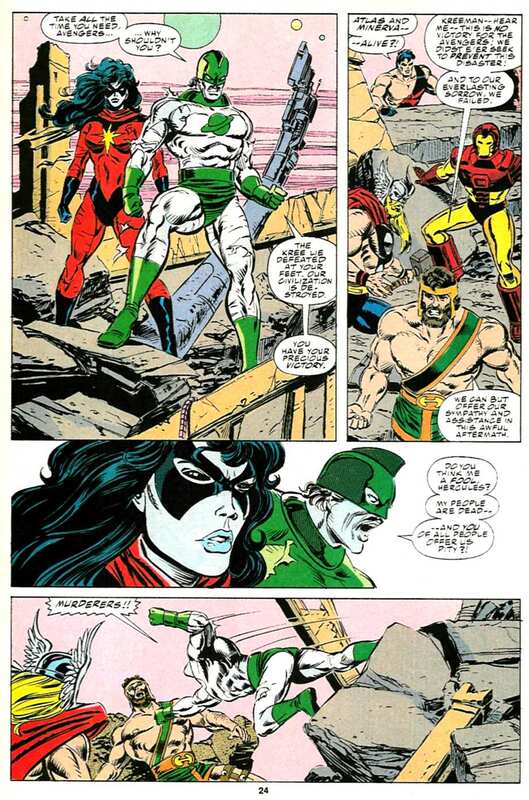 I mean, the kill line up is Wonder Man, Black Knight, Iron Man, Vision, Thor (Eric), Sersi, and Hercules. 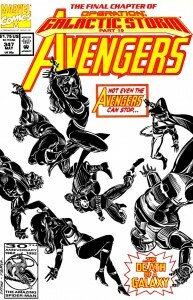 Black Knight aside, that's one of the most powerful lineups of Avengers you could name. Quasar could probably go toe to toe with any of them individually, but together.. whoof. All in all, this is a real gem of a dilemma. These days it almost seems quaint, as comics seem to have tossed aside the whole 'We don't kill, EVER' debate for a more pragmatic "We don't kill, unless we have to.' 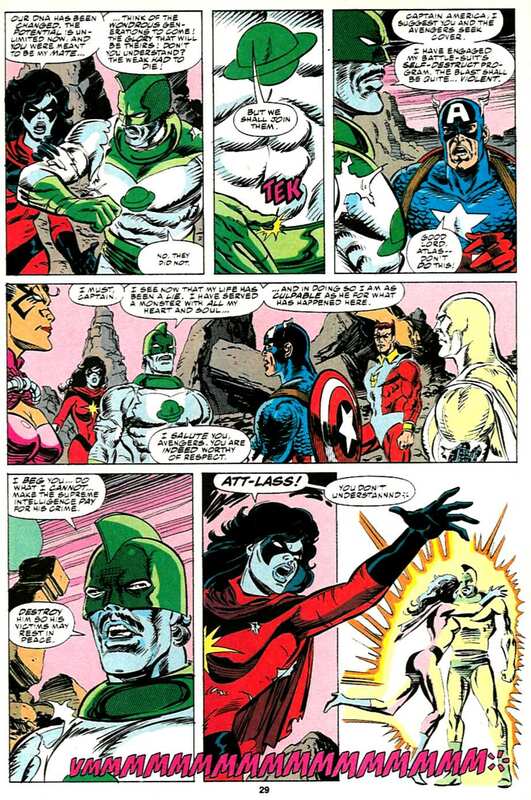 I doubt today's Cap, Crystal, Clint, Wanda, or Monica Rambeau (I can't remember her current name) would blink about killing someone to save lives. 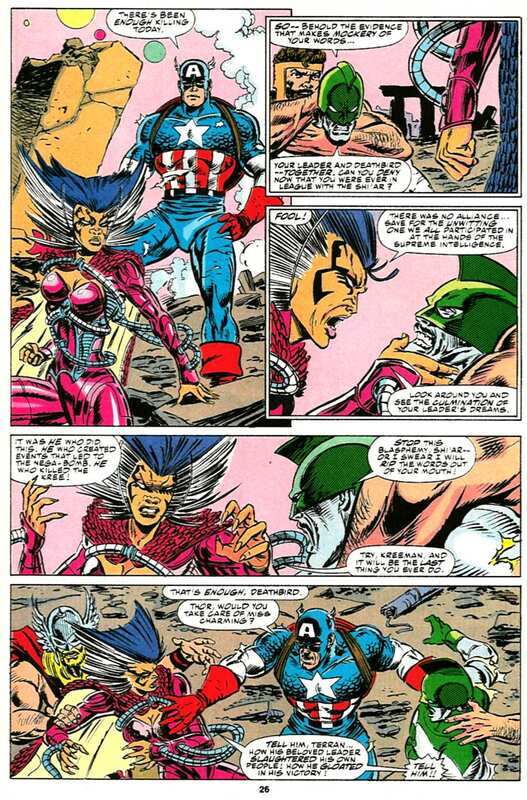 Hell I think Starfox was recently involved in a plot to kill his brother (Though when you're talking about Thanos the rules might change a bit). Heck, even the new Quasar is killing aliens left and right when they decide to have her show up. But would any of them be up for a punitive slaying like this? You could probably still spin it as an interesting story today from that angle. 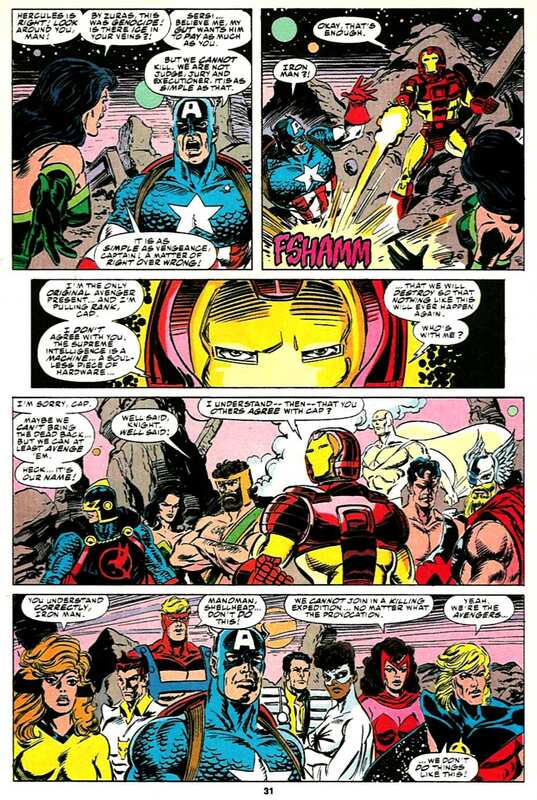 I do think this schism was buried a bit too easily in subsequent stories, and I know Galactic Storm was bit of a 90s bore that dragged on a bit, but this specific beat here is one of the most 'Avengers' plotlines I can think of, and it shines as probably the last really great moments before the Crossing, I think. Adding to the dilemma is whether or not the Supreme Intelligence is considered a "living" (sapient) being. 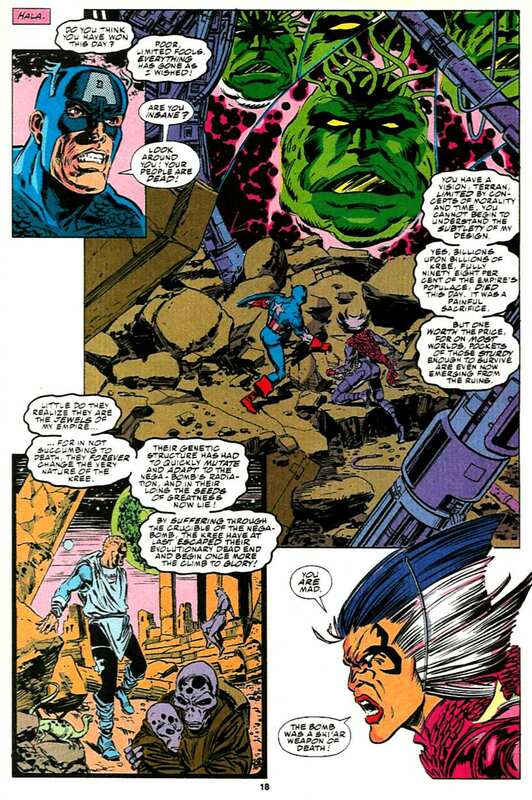 IIRC, the SI is an amalgamation of the brains of the greatest Kree mind (generals, philosophers, and scientists), taken after they died (and so presumably after theirs souls departed to whatever afterlife awaited them). Does the SI possess a distinct and unique mind, or is it just a copy, a parody made up of hundreds (thousands? millions?) of dead Kree operating at super-fast speeds to appear super-intelligent? Does the SI have a soul? And I do find it interesting that Vision was the first to comment on the SI's non-living status. Spectrum. Monica's current name is Spectrum. 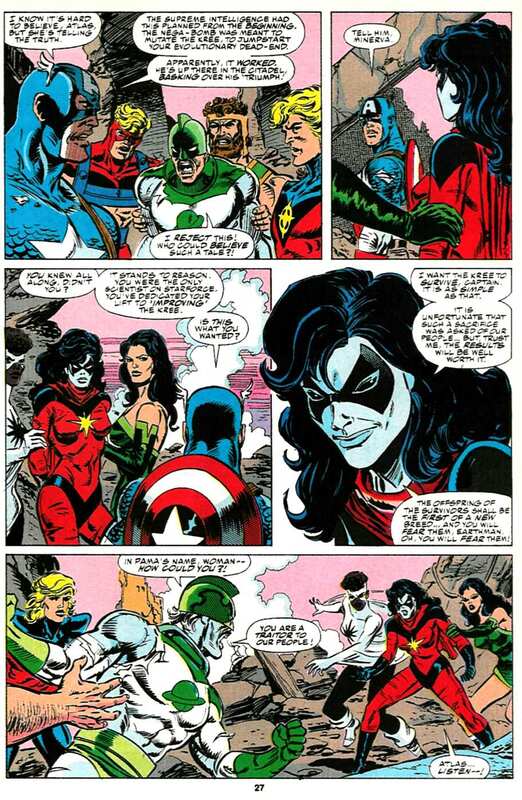 And it was kind of a thing in Ewing's Mighty Avengers that Monica can kill. And easily at that. She could crack the Earth in half if she tried. As far everyone else... these days characterisation largely consists of either how they act in the movies or whatever the hell the writer thinks it is this week. 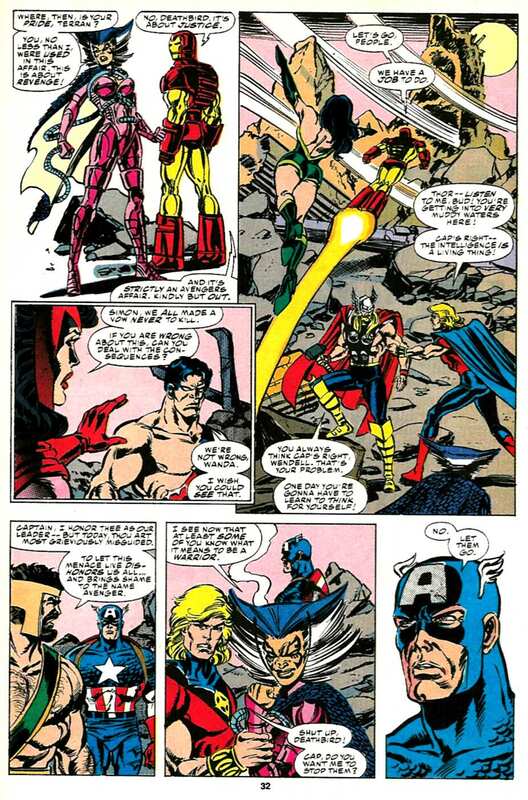 And these days, a story like this would probably involve the Avengers getting into a massive, pointless brawl that breaks the team up yet again. Yeah, more and more, comics have adopted a more pragmatic approach to heroes killing, rather than the hard line in the sand it used to be, save for a few exceptions like Spider-Man or Batman. The split does make sense, by and large. Hercules and Sersi are from ancient cultures and are immortals not subject to conventional morality, Dane fought in medieval times, and the Vision was at his most emotionless here and probably did the cold equations of it. 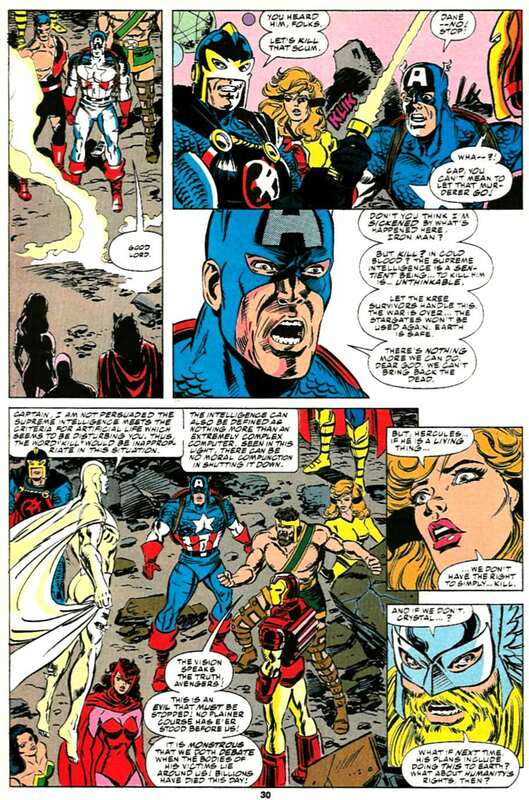 Of course, this was also during the general period of time where they were trying to tell us that Cap had never killed anyone, ever, even in war. 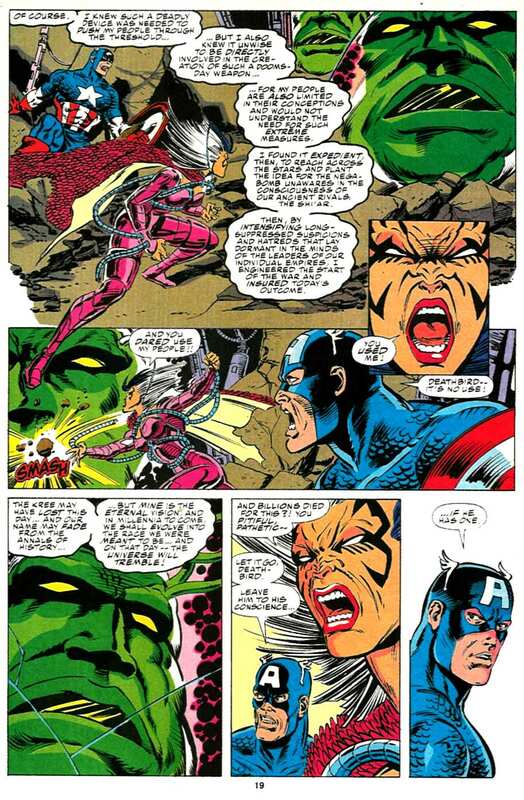 And we had seen Captain America killing people in the "modern age" on-panel. Baron Blood and that one ULTIMATUM solider. It haunted him, of course. The "Captain America killed Nazis during World War II" line has become an excuse for anything. Though even I find it harder to "count" vampires.